Diabetes mellitus is a metabolic disorder where a deficiency of insulin or the unresponsiveness of cels to insulin leads to elevated blood glucose levels. Proper treatment and effective management can help delay or even avoid certain complications associated with diabetes mellitus but eventually its effects become evident. In the well managed diabetic patient, the complications may be minimal or restricted to a few organs. However, in poorly managed and long standing cases, the complications may affect most organs and almost every system in the body. One of the common problems associated with diabetes, particularly long standing and poorly managed cases, is the host of lower limb complications broadly referred to as the ‘diabetic foot’. 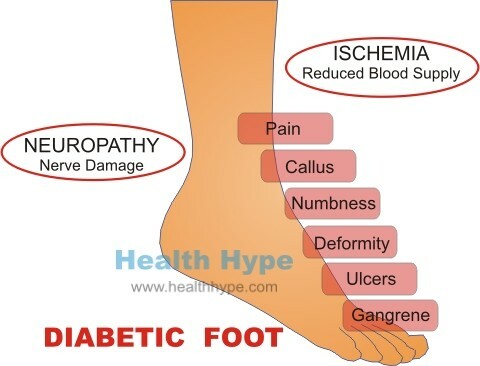 Diabetic foot is the common term for the complications seen in the lower limb, particularly the foot, in diabetic patients often as a result of neuropathy and peripheral vascular disease. The combination of these factors, along with impaired immune functioning and poor wound healing, makes the foot the ideal site for a host of pathology that falls under the term of ‘diabetic foot’. Although the term ‘diabetic foot’ may sound fairly innocuous, it has potentially life-threatening consequences if not treated and managed effectively. How does diabetic foot occur? Diabetic foot arises due to a combination of factors associated with reduced blood supply to the foot and nerve damage. Superimposed infections then cause the final, and often irreversible, damage to the foot. Elevated blood glucose levels as is seen in diabetes mellitus (sugar diabetes) damages tissue throughout the body over time. Two structures that are extremely sensitive to these high sugar levels are the blood vessels and nerves. The arteries are the blood vessels that carry oxygen-rich blood to the tissues. It has thick elastic walls to keep blood propelled and withstand the higher pressure within it. In peripheral arterial disease (PAD), the artery slowly becomes narrow due to one or more factors, the most common of which are atherosclerosis and blood clot formation. This is further exacerbated by the calcification of the artery walls and nerve damage (autonomic neuropathy) which does not properly regulate the blood flow to the lower leg. In diabetes mellitus, the calf vessels are often affected even though the arteries of the foot may be spared to some extent. The peripheral tissue, starved of oxygen and nutrients, is not able to repair itself as efficiently (wound healing) and cannot fight off infection as necessary. Damage to the nerves is known as neuropathy and affects the function of the nerve. In diabetes mellitus, it is known as diabetic neuropathy. This presents as abnormal sensations, pain or numbness. There is pain of the limb despite numbness of the skin. When there is autonomic neuropathy, the regulation of blood flow is impaired and the veins become distended. At the the same time, the sensation to the leg and foot is diminished as a result of somatic neuropathy. With impaired sensation, even the slightest injury may not attract the awareness of the patient. This can quickly lead to complications given that there is poor wound healing and immune defenses in the area. The signs and symptoms varies dependent on the duration and severity. The ischemic foot (reduced blood flow) tends to be painful, cool with atrophic skin and absent foot pulses. The neuropathic foot (nerve damage) tends to be painless or even numb, warm with dry skin and bounding pulses. Apart from the development of ulcers discussed below, ischemia may lead to gangrene. This is usually seen in the toes (digital gangrene). In severe cases, the foot appears dark (blue to black), has an offensive smelling discharge and is swollen. Patients may report initial pain followed by numbness and a fever may be present. The diabetic foot may also be deformed due to weakening of the bones and minor fractures that arise with trauma to the foot. Since the patient’s sense of pain is impaired as a result of autonomic neuropathy, the patient continues to walk on the foot and does not seek medical treatment. This condition is known as Charcot’s neuroarthropathy and is characterized by deformities of the feet and formation of ulcers associated with increased foot pressure. Diabetic foot pain arises as a result of several mechanisms. With peripheral arterial disease, diminished blood flow leads to ischemia – tissue damage associated with reduced blood flow as the cells cannot receive sufficient oxygen and nutrients. This may initially appear as intermittent claudication – pain in the leg and foot when walking. Over time, patients note persistent pain particularly at night (progressive night pain) as blood pressure and cardiac output drop during sleep. In the early stages there may be some relief by hanging the leg out of the bed but with time, even this does not help. Patients may have to awake frequently to walk around for just a short while to relieve the pain. It leads to a significant loss of sleep and patients attempt to find other ways to diminish the pain intensity and frequency. Sleeping on a chair may appear to offer temporary relief but actually exacerbates the problem as dependent edema leads to further reduction in arterial blood flow (perfusion). While (nerve damage) may be the cause of the pain in the early stages, it quickly leads to reduced perception of pain and eventually almost total numbness. Other sensations, including touch, temperature and pressure, are also affected. This contributes to tissue damage and the formation of diabetic ulcers. Foot ulceration arises due to multiple factors in diabetes mellitus. Poor blood flow that leads to tissue damage (ischemia), diminished sensation in the foot, excessive dryness of the skin and changes in the connective tissue all contribute to the development of foot ulcers. Increased foot pressure leads to the formation of calluses which may then ulcerate. Even in the absence of calluses, the skin is prone to ulceration due to ischemia, particularly if preceded by some trauma, even a minor injury. Diabetic ulcers tend to occur on the margins of the feet or soles (plantar surface). These ulcers are usually painless and prone to secondary bacterial infections which further exacerbate the tissue damage. Impaired immune defenses and poor wound healing may lead to deeper infections which can spread rapidly if treatment is not initiated as early as possible. An abscess, cellulitis, osteomyelitis or sepsis may be seen as a result of the infection. The skin surrounding the ulcer is red and swollen, often presenting with a bad odor and oozing pus. The key to treating and managing or even preventing diabetic foot is educating the diabetic patient who is at greatest risk. These are diabetic patients with long standing and poorly controlled diabetes, who smoke, have high blood cholesterol and high blood pressure (hypertension). Early attention to even minor signs and symptoms can prevent the major complications associated with diabetic foot and avoid amputation. The role of a podiatrist is therefore indispensable. Inspect feet daily, particularly the areas of greatest risk – the margins and soles of the feet. Good foot care involves washing the feet daily, moisturizing the skin and cutting and filing the toenails regularly. Proper fitting shoes, or specially manufactured orthotic footwear, will help to prevent ulceration. Attend to minor cuts and bruises and monitor it closely. Remove corns or calluses at home. Place feet in extremely hot water. Ignore even the smallest sore. Undertake any strenuous activity involving the feet like running or walking for long distances. Visit a podiatrist regularly to have the feet inspected, calluses removed and for general foot care. Ensure good glycemic control by taking medication daily as prescribed and adhering to a diet as suggested by a registered dietitian. Infection needs to be treated immediately with topical antimicrobial applications and/or antibiotics.